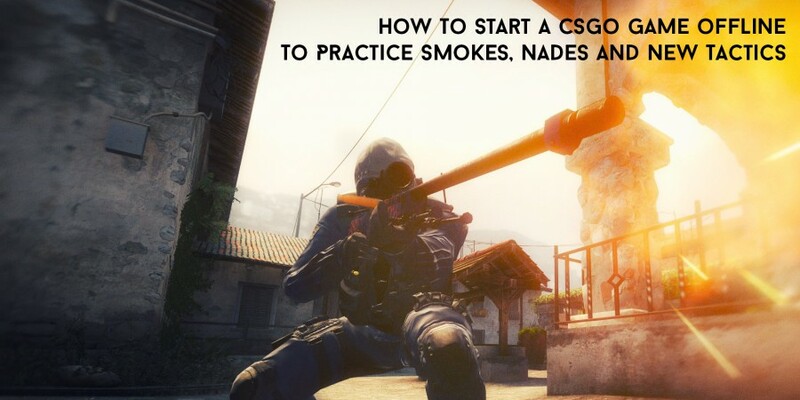 This is a tutorial on how to practice smokes in CSGO and how to practice alone in CSGO including all the commands. First off you need to make sure that you have console enabled, go to Help & Options -> Game Settings -> Enable developer console. Once this is opened it should default to the button just left of your number 1, the ` key. Now, in your console (press ` while in the main menu) type map dust2, or whichever map you want to practice your smokes, flashes and tactics on and press enter. This will enter you in to the game on the desired map. Once you are in game you need to type a few commands in to your console to set up the game correctly for your practice. Here they are, for more CSGO configs click here. If you want to give weapons at once just type “give weapon_hegrenade” in to console. This will drop one HE grenade, if you want to drop an AK change it to “give weapon_ak47” and so on for all the weapons in the game. What these commands do is set up the game with a 600 minute roundtime with the ability to hold five nades and see the trajectory of the nades you throw. As well as this it binds ; to noclip (this allows you to fly around the map), binds [ to give you a flashbang, binds ] to give you a smoke grenade and binds ‘ to give you a molotov, and because we also enabled sv_infinite_ammo 2 you only need to press these once and you can throw as many nades as possible. Side note, these binds can be added to your autoexec.cfg so you don’t have to keep typing these commands in to your console, the other commands could be added to a practice.cfg file in the same place as your autoexec so you can just type exec practice.cfg in to your console and it will run every command you enter in to that file. bind k "toggle host_timescale 7.99 1"
This command is particularly useful when you’re learning or trying to figure out a new smoke for a certain position and you want to make sure there are no gaps or which smoke is the smoke you just threw. Also, this command is good for showing team mates the smokes you have just found or for finding reference points when learning the new smokes. This will make your crosshair stretch to the edges of your screen when h is pressed and then change back when pressed again. bind h "toggle cl_crosshairsize x 1000"
UPDATE: A great way of skipping most of this is by putting the game in to warm up. You will still need most of the commands above. If you change out the round time command above and change it to mp_warmup_time 999999 and then use mp_warmup_start. You won’t need an integer after mp_warmup_start it is simply to start the warmup timer. To stop this use mp_warmup_end.